Sadie Navarro is facing all the typical growing up challenges that a twelve-year-old girl finds at school and home. But Sadie has a secret -- one so personal she's afraid to share it with anyone. Increasingly Sadie finds herself lost and alone. Then, at a local stable, Sadie meets and bonds with her horse Lucky. Their growing relationship becomes the healing foundation that gives Sadie the strength and courage she needs to overcome the anxiety and self-esteem demons plaguing her. BELIEVING IN HORSES, TOO is a wonderful, touching, and heartwarming coming-of-age story. Father Ron Carmada's Review - Believing In Horses might just rescue you, too! Valerie Ormond encourages the reader to take a soulful ride with rescued horses that have survived a certain early death. Believing in Horses, Too might just rescue you too! Ormond allows her 13 year old heroine to realistically grow up with the help of honest parents, teachers, mentors and bullies. Yes, bullies and antagonists can offer great opportunities for growth. Being a rescued horse turns out to be a way to walk, trot or cantor into the souls of human beings; especially veterans, differently-abled, and children of parents deployed in a war zone. The book is very spiritual. It is informative about horses and human behavior. “And those guys have a way of connecting with the soul like no other animals.” Sadie found facing her fears enriched the soul. She isn’t the only family member who needs the horse therapeutic approach to face her fears. Believing in Horses, Too is very spiritual and a fun read. Ormond’s book could be used as part of a holistic approach to veteran family therapy and coping skills. And let’s not forget grandparents! Valerie’s long and distinguished Navy career and love of horses is just the training needed for a blue ribbon finish. A country whose children are engaged has a future. Sadie, the main character is the poster child for engaged. Thirteen going on 30! Wise beyond her years, focused, goal oriented, she will become a hero to all who read about her. In a time where children are dismissed as unimportant, lazy or simply overly attached to their electronic world, Sadie demonstrates page after page what hard work and relentless effort can attain. Parents, if your child’s school does not have this in their library, does not make it required reading you need to be “Sadie” at the next school board meeting. I like this book because it has adventure and horses. They are two of my favorite book topics. The author wrote this book in a friendly, easy tone. If she wrote it any other way, I wouldn’t have enjoyed it nearly as much. I hope that whoever reads this book likes it as much as I did. I recommend it for anyone 10+. LitPick - "The latest in preteen and teen literature reviewed by a global community of students." There is good reason this book has won so many awards. It is a really lovely tale that is carefully threaded with life lessons and perfect for the 9 year olds and up, regardless of whether they are a horse crazy kid or not. This book is well written and the plot carries the reader effortlessly along while quietly educating at the same time. The main character Sadie Navarro inspires empathy and her development throughout the tale as she takes on bigger responsibilities, has to overcome fears and learns to trust herself, is a well rounded and highly likable personality. Overall an intelligently written, non preachy, highly entertaining read that leaves the reader feeling happy and inspired. ...a charming, fast-paced, intriguing first novel that provides a blessed break from stories centered around grim problems of destructive behavior and dysfunctional families. ..."Believing in Horses" is a strong addition to young adult fiction collections, not to be missed. "This is a great book about a young girl, her bonds with her horse and family, and the real difference that one determined, persistent, passionate person can make in the world." ﻿AND FROM THE UNITED KINGDOM! AMAZON - FIVE STARS FOR BOTH BOOKS!!!!! Valerie Ormond's second book about her plucky heroine, Sadie Navarro, teaches as well as entertains. Although this is sequel, the story can stand alone without having read the previous book. We are introduced to Sadie who is somewhat of a local hero for having saved slaughter bound horses. Despite her previous displays of courage, she is haunted with the fear that something awful might happen to her dad who is stationed in Afghanistan. Confronting her fears, Sadie takes on a mission to help others through "horse therapy"--including some wounded veterans. This theme of helping "damaged" horses and "damaged" people runs through the story, as Sadie encounters bullies at school who are acting out of their own personal fears. As readers, we are uplifted to see how a horse, like a person, considered by many to be a "throw away" turns out to have the most to teach us. The book has a lot to tell us about the value of various therapeutic riding programs. The story imparts an uplifting message to young/middle grade readers with clear, role model characters. It is also refreshing to read a story featuring a military family and one which explores all the challenges required from a life of such service for both the service member and extended family. Definitely a "feel good" book. Looking for an excellent book for middle schoolers and YA readers? Believing in Horses is just that! Sadie, the main character faces struggles when she has to move and her father deploys to Afghanistan. Sadie is a twelve-year-old who proves that kids can accomplish great things, that it is okay to struggle, and things don't always go right, but struggling for what you believe in can be worth it all in the end. Life isn't easy, and this book is realistic in sharing that fact. People who love horses or other animals will especially enjoy this book, but it should not just be read for that reason. This book shares how a young person can set goals and what it takes to achieve something very special. Author Valerie Ormond added tension and suspense to Believing in Horses, which opens up the book to many more readers. This is an uplifting book, which I highly recommend. As a teacher/parent, I want people to know that Valerie Ormond's brother, Edward Ormond (who has an educational background) has created Teacher's Tack, a teacher's resource to accompany Believing in Horses. I can see Mr. Ormond's teacher's heart come through this guide. It is packed with high-level thinking activities. As a teacher of 36 years, who truly believes in challenging our students, I was thrilled to see the inclusion of activities based on Howard Gardner's multiple intelligences. Teacher's Tack is a superb resource for home schoolers and/or public schools. If I was still in the classroom, this would be one book I would share with my students, and we'd enjoy learning through the experiences provided in this resource. I just finished reading "Believing In Horses"; I thoroughly enjoyed reading this very well written book. This is must read for all ages; whether you have a horse or had a horse, you will be captivated with this wonderful journey of one little girl, Sadie, who has a heart of gold, believes in second chances, inspiring those that enter her life. After reading, you will most certainly believe, anything is possible with a team, good friends, and family by your side. With the holiday season approaching, if you have someone in your life that loves to read,this book makes a great gift. Wow! If you're looking for a book you can't put down, this is your book. You don't have to be a horselover to be sucked into the emotional rollercoaster that Sadie's life has become. If you are a horselover, you won't be disappointed, for we horselovers know a good horse can help you overcome anything life dishes out. A must read for all horse loving gals! This book is not only entertaining and suspenseful, it is instructional for both children and adults! I really enjoyed reading the story and learning about issues related to horses. This story artfully weaves in some important skills for students: researching a topic, communicating with adults, e-mailing, and showing respect for others even though you may not agree with them. It is a great story about not dwelling on loneliness, becoming passionate about something, becoming an advocate, reaching out to others, making new friends, and helping animals - all things young readers will love! Young readers are very altruistic at heart and will really relate to the main character's persistence and this story's ultimate lesson in finding out that when you help others, you are helping yourself! I bought this book for my daughter because she missed her home on the East Coast when we moved to California. She loved it, and even now it sits prominently on her bookshelf among her favorites. My only problem now is that she wants to ride horses more than ever....! This is a beautifully told story of a young girl who embarks on an adventure to save unwanted horses. I thoroughly enjoyed every page and look forward to a sequel. I loved the photographs at the beginning of each chapter and I felt like I was right there with Sadie at every turn. I would definitely recommend this book for people of all ages who love horses, are from military families, have teenagers, have an interest in politics or just plain love a good story. And on top of being an emotionally beautiful story, it is educational too! Get yourself a copy...you won't be disappointed! TO SEE THE MORE GREAT AMAZON REVIEWS, CLICK HERE. 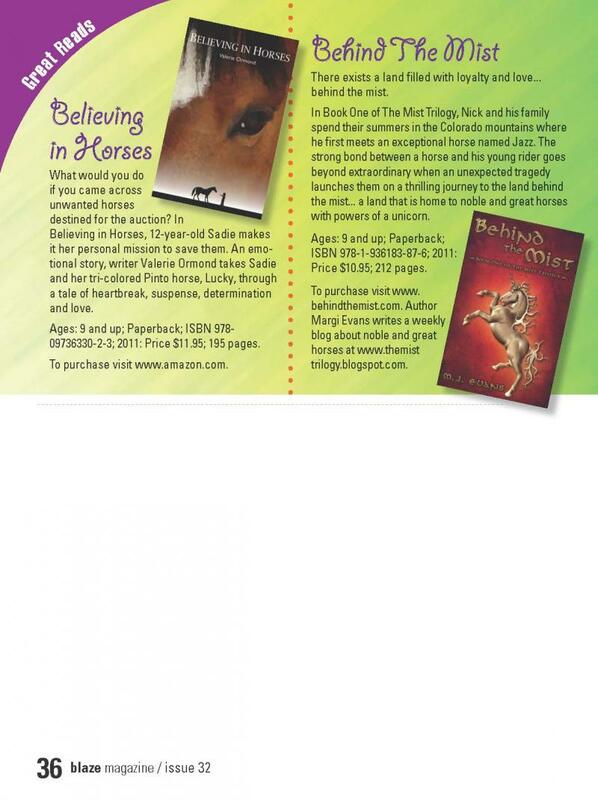 believing in horses, too wins the gold medal in the military writers society of america book awards! Believing In Horses is a YA reader concerning horse rescue and the determined twelve year old who vows to save them. 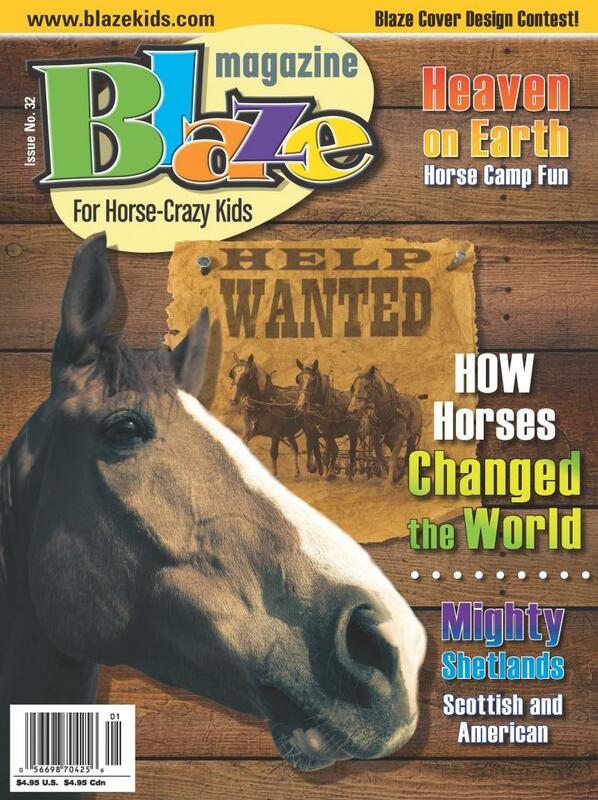 BLAZE Magazine Good Reads Selection! "An emotional story, writer Valerie Ormond takes Sadie and her tri-colored Pinto horse, Lucky, through a tale of heartbreak, suspense, determination, and love."